Assets are a company's resources—things the company owns. Examples of assets include cash, accounts receivable, inventory, prepaid insurance, investments, land, buildings, equipment, and goodwill. From the accounting equation, we see that the amount of assets must equal the combined amount of liabilities plus owner's (or stockholders') equity. (2) a source—along with owner or stockholder equity—of the company's assets. Assets - Liabilities = Owner's (or Stockholders') Equity. Owner's or stockholders' equity also reports the amounts invested into the company by the owners plus the cumulative net income of the company that has not been withdrawn or distributed to the owners. If a company keeps accurate records, the accounting equation will always be "in balance," meaning the left side should always equal the right side. The balance is maintained because every business transaction affects at least two of a company's accounts. For example, when a company borrows money from a bank, the company's assets will increase and its liabilities will increase by the same amount. When a company purchases inventory for cash, one asset will increase and one asset will decrease. Because there are two or more accounts affected by every transaction, the accounting system is referred to as double-entry accounting. A company keeps track of all of its transactions by recording them in accounts in the company's general ledger.Each account in the general ledger is designated as to its type: asset, liability, owner's equity, revenue, expense, gain, or loss account. 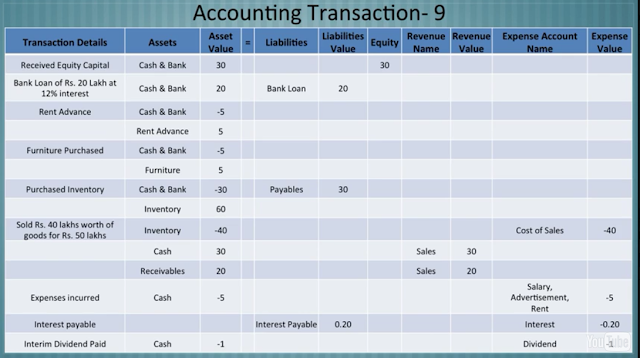 We created a visual tutorial to demonstrate how a variety of transactions will affect the accounting equation and the financial statements. It is available in AccountingCoach PRO along with test questions that pertain to the accounting equation. 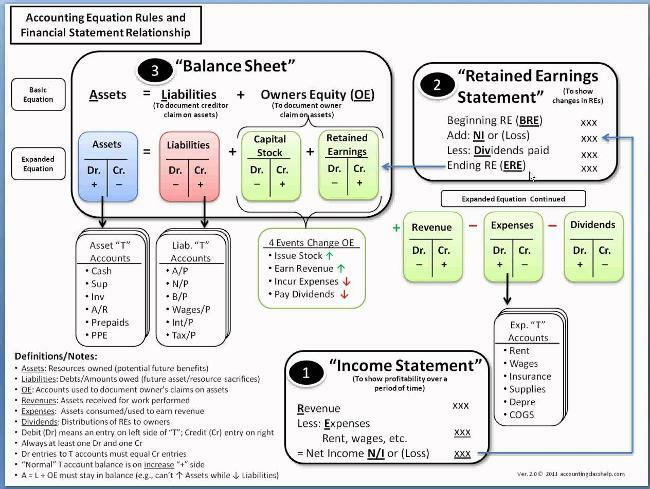 The balance sheet is also known as the statement of financial position and it reflects the accounting equation. The balance sheet reports a company's assets, liabilities, and owner's (or stockholders') equity at a specific point in time. Like the accounting equation, it shows that a company's total amount of assets equals the total amount of liabilities plus owner's (or stockholders') equity. The income statement is the financial statement that reports a company's revenues and expenses and the resulting net income. While the balance sheet is concerned with one point in time, the income statement covers a time interval or period of time. The income statement will explain part of the change in the owner's or stockholders' equity during the time interval between two balance sheets.